Babel launched the Young Writers’ Competition in 2014, inspired by an article we published in 2013 by young linguist Kateryna Pavliuk on British Sign Language. In 2015, we introduced two different categories – one for 16-18-year-old linguists, and another for undergraduate linguists. You can read all of our Young Writers’ Competition winners below. Our 2019 competition will open in May 2019 – so keep an eye on our Facebook and Twitter pages for details, or email us to ask to be sent news. Our winning linguists will be published in Babel No29, to be published in November 2019. The winner also, of course, receives a year’s subscription to Babel! Entries should be between 1,500 – 2,500 words in length, and can discuss any topic to do with languages and linguistics. The winners are announced in October of each year. 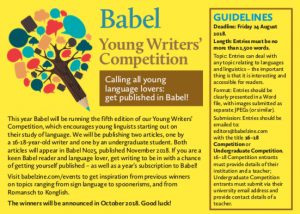 Download our guidelines, and submit your entries or any queries you may have to the Babel editors. You can also get inspired by reading our previous winners! 16-18-year-old winner: Kiana Rezakhanlou – Language and nationalism: One nation, one language?